Every celebration big or small is celebrated with something sweet in our home. I love to bake and make my sweets whenever possible, however due to the lack of time I like having yummy, healthy desserts and snacks in the fridge. I think every meal to be complete, needs a little sweet snack or dessert and Yopa has made this list in our home. There is no gelatin, artificial flavours or colour in this yogurt. Yopa made with real fruits has 0% fat and 80 calories per serving. With Yopa, I am glad that we get double the protein. I found the yogurt to be thick compared to some Greek yogurt we have purchased before. I like that the yogurt is already stirred, which is less messy especially when we are serving children. My children really enjoyed the mango tango Yopa flavour, which is the only one we tested so far. My son, who is picky about yogurts actually asked me for one after finishing his play dough project and said it is really yummy. I had a little bit of granola with raisins and nuts to add some crunch to my yogurt, which is how I usually indulge my yogurt. I like that the Yopa yogurt is not too sweet. 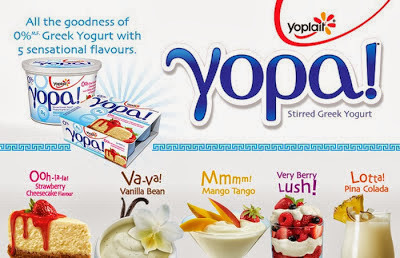 I think $4 for 4 x100g containers is a little pricy, however I would still buy this thick, stirred Greek Yoplait Yopa yogurt because we enjoy its unique flavour. I am looking forward to try the Strawberry cheesecake, Vanilla bean, Berry lush, and Pina colada. Join us on September 24th at 8pm EST on twitter using the hashtag #OpaYopa. If you live in Canada you can win a Yopa Prize Pack valued at $100 before October 15th. Please enter through the rafflecopter below, leave comments and follow my social media networks to be eligible. Winner will have 48 hours from the time of contact to claim their prize that will arrive in 4 to 6 weeks. You can enter similar giveaways in other sites, however you are eligible to win only one. I live in Alberta. I enjoy yoghurt with chopped fruit and granola. I'd like to try Mango Tango first. I live in Ontario and would love to try the Strawberry cheesecake flavor. I live in Ontario. I absolutely love this yogurt! The vanilla bean is my favourite but I'd love to try the very berry lush! I'm in Ontario. I love eating flavoured yogurt after dinner with my girls. The strawberry cheesecake flavor sounds really interesting.....would love to try that out first and foremost. I'm in BC. I usually add fruit to my yogurt. I like to try the Very Berry Lush first. I like to eat my yogurt just the way it is with no add-ins. I would like to try the Strawberry cheesecake flavour. I'm in Ontario. I love adding granola and berries to greek yogurt. I'd try strawberry cheesecake first! I live in BC and I love eating it as an evening snack. Strawberry cheesecake would be the first I'd try! I live in Ontario and I'd like to try the Vanilla Bean flavour first. I live in Alberta and would love to try the vanilla bean yogurt! I'm from Ontario and I like to add hemp seeds to my yogurt. I want to try strawberry cheesecake. I'm in BC, I like yogurt with fruit and granola or slivered almonds. The strawberry cheesecake would be the first one I'd try! I live in Ontario. I like my yogurt with sliced berries. I'd love to first try the Strawberry cheesecake. I would like Mango Tango and enjoy it just as it is. i live in Ontario, i like to enjoy my Opa moments with my son and we love mango so we'd try that one first! I live in Newfoundland,,I never tried this before,,sounds yummy! I would try the Strawberry Cheesecake,,topped with granola,yum! I live in Quebec,I would like to try Pina colada! I am in Quebec and would love to try the Pina colada! I live in NL. I love greek yogurt and love to add in granola for breakfast. I haven't had the chance to try Yopa yet. Forgot to mention which one I'd try first. I think I'd try the Pina Colada first. I live in Ontario. I usually eat my yogurt as is, but occasionally will add some granola to it. I am most looking forward to trying the Vanilla Bean. I live in Ontario and would try the pina colada first. My opa moment to myself is in the evening after everyone has settled and it's peaceful! I live in Manitoba. I enjoy my OPA moments as a special treat along with my favorite shows and I would LOVE to try the Strawberry Cheesecake! Ontario in the morning for breakfast and the VaVa Vanilla Bean for me! Ontario, at breakfast with fruits and granola. I would try the strawberry cheesecake first. Ontario, at breakfast with granola. I would try the Strawberry Cheesecake first. I enjoy my OPA moments with a cuppa coffee. I'm from Ontario and would like to try the pina colada flavour. I try to savour my OPA moments with a cuppa coffee. I'm from Ontario and would like to try strawberry shortcake. I live in BC. I'd like to try the Ohh Lala Strawberry Cheescake first. I enjoy my OPA moments in the evening when the kids are in bed. I live in MB, I like my Yopa moments on my morning break at work, and I like strawberry. I live in ON. I like to enjoy my OPA moments with my partner, and I would love to try Pina Colada first. Manitoba. Enjoy yogurt just as is, but sometimes add Hemp Hearts. I would try the Pina Colada first. In Ontario. I enjoy my Yopa moments during my break. Would love to try Mango Tango first! I live in SK. I have Opa moments by myself relaxing. and would love to try the Pina colada! I am in Ontario. I enjoy my opa moments by relaxing and taking a couple minutes for me! I want to try the Strawberry Cheesecake! I'm in Ontario. I enjoy my Opa moments with some me time relaxing with a cup of tea. I'd like to try the Vanilla Bean and Mango Tango. From Ontario and I like to enjoy OPA moments on my own first, and then share if I feel like it, and I'd love to try the Vanilla bean. I am from Ontario. I would definitely eat these as a late afternoon snack or dessert. I would love to try Strawberry Cheesecake first. Sounds so good!